It appears that Samsung is ready for another round of “It’s Time to Tab” commercials. Today Samsung has officially announced the Samsung Galaxy Tab 7 Plus will be available across a wide array of retailers such as Amazon, Best Buy, Fry’s and many other retailers starting November 13th. The new Galaxy Tab 7 Plus features Android 3.2 Honeycomb and will come in both 16GB and 32GB variants. Pre-orders will start at select retailers on October 23rd. Officially announced back in September we actually have already seen a few pre-orders for the new Tab and reported them already listed at Amazon just yesterday. For more details on the new Tab all the info is in the official announcement. We have a 7.0″ 1026 x 600 resolution display (no 1280 x 800 here), Android 3.2 Honeycomb, 3 megapixel camera around back and a 2MP shooter on the front. a 1.2 GHz processor, 1GB of RAM and will come in a 16GB and 32GB model. Along with the top of the line dual-core processor we have the usual proximity, accelerometer, digital compass, gyro and ambient light sensors. The Galaxy Tab Plus will come with the TouchWiz UI over 3.2 Honeycomb and we’ve also heard a 3G/4G connected version will be coming to shelves soon. 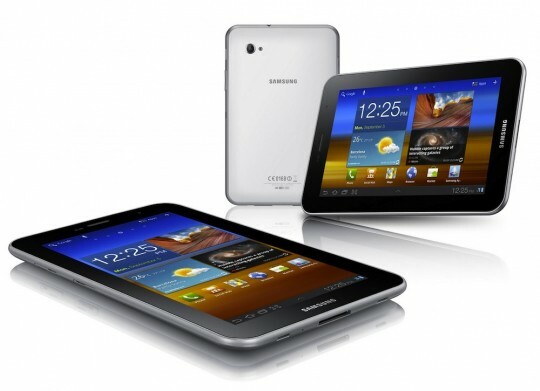 The Samsung Galaxy Tab 7″ Plus starts at just $399 for the 16GB model and it can be yours on November 13th. Who will be buying or is the low screen resolution enough to make you opt for something different?